This past week, I began reading N.T. 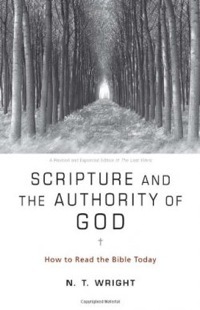 Wright’s newest work, Scripture and the Authority of God: How to Read the Bible Today. I appreciate Wright’s writings and teachings across so many areas, and so I confess that I have entered into reading this book with the expectation that it will be both solid and refreshing. So far I have not been let down. I particularly wanted to post two striking quotes, which are found early on in the book in the first chapter. I believe these two quotes are central to our understanding not just a doctrine of Scripture, but the nature of God Himself. This is absolutely vital to understanding God and His work amongst creation. The word of God, the final word, is that of Jesus Christ himself. As I have expressed here before, if anything, we have a Christ-centred faith. Christ is central in all that we believe, proclaim and live. It is very true that the Scripture attests and points to this central word-logos of God, the divine Son of God. But Scripture finds itself subservient to a greater purpose, which is that of not first and foremost endorsing itself but ultimately confirming the great Word of God, Christ. And, not to mention, that this incarnation of the Living Word (the divine becoming flesh) informs and energizes right across our understanding of creation, humanity, church, mission, eschatology, and all other theological concepts. My heart cries out – Exactly! If our Christian faith is centred in Christ, then whatever we approach – Scripture, ecclesiology, eschatology, soteriology, etc – must be centred in recognising the authority of Christ. For our Lord did not say, himself, that, ‘All authority in heaven and on earth has been given to Scripture.’ Rather, we know he correctly stated: ‘All authority in heaven and on earth has been given to me‘ (Matt 28:18). For many, this is all quite easy to acknowledge and accept: God-Christ are our great authority and Scripture is the main avenue of the exercising of God’s authority in the church and world. But I bring up these quotes to remind us that, when we speak of the role of Scripture, it’s authority, I believe our confession should communicate the Bible’s responsibility to point to the authority and lordship of the one who now claims all authority in heaven and earth – Jesus the Christ, the divine and living Word of God. This entry was tagged Bible, N.T. Wright, Scripture. Bookmark the permalink. and is fulfilled as I intend. God’s Word is inherently powerful and creative; it can never remain static. Thus it was only natural that God’s own Son should be His incarnate Word. Ok, I just ordered the book. It is a shorter book more tailored to popular-pew Christianity rather than academia. But still good. I was actually going to post an article soon with my top 4 or 5 books on an intro to understanding the Bible and nature of Scripture. Have you read Scot McKnight’s The Blue Parakeet or Peter Enns’ Inspiration & Incarnation? They are 2 very good books. No I haven’t read either of those. I’ve read a lot of quotes by both authors in other books though. I too stand on the Holy Scriptures as my truth, and the truth God has given me. And by faith I pray to Christ, my God, who has given me a Teacher/Helper, His Spirit, to teach me and help me understand God’s Word. If we ever leave the Scriptures, then we will fall into error from all the crafty devils, who will deceive us, as that have throughout the history of this earth; from Adam to the first Pope, etc. Have a blessed Lord’s Day my friend.